Bradford’s Council is to raised a pride flag above City Hall, to mark the start of LGBT History Month, which runs for the whole of February. 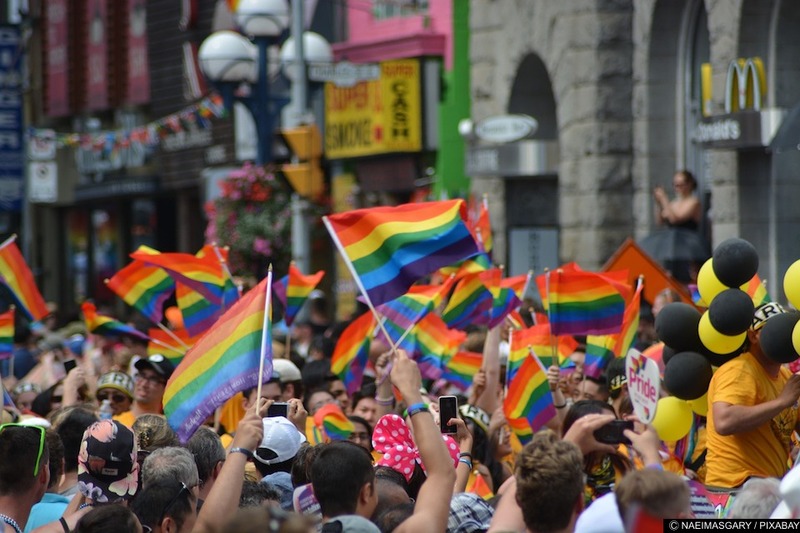 A rainbow flag will be raised on Friday, 1 February outside Bradford’s City Hall, to mark the start of LGBT history month 2019. Events will be taking place throughout the month. The flag will be raised at Bradford Council’s Centenary Square flagpoles. All are welcome to attend the ceremony, at 10am on 1 February. LGBT (lesbian, gay, bisexual and trans) history month is held in February each year to celebrate and recognise LGBT+ people and culture, past and present. This year’s theme is Peace, Activism and Reconciliation. Bradford Council’s Youth Service will be marking LGBT history month with a series of youth group sessions throughout the month focussing on LGBT+ themes. Organisations are putting on events to celebrate LGBT history month. West Yorkshire Queer Stories, a collaboration between Brick Box Rooms and Leeds Queer Film Festival, is hosting a night of queer short films from 7pm on Thursday, 14 February at The Brick Box Rooms on Ivegate, Bradford. At the same venue, Brick Box Rooms will be hosting their own ‘Strike a Pose’ night, with a film screening, vogue dance workshop and party. This will be from 7pm on Saturday, 16 February. Bradford College is providing a programme of films, documentaries, exhibitions and workshops. A highlight will be a lunchtime screening on Wednesday, 13 February of the documentary Invisible Women, ‘the story of two LGBTQ revolutionaries’. This will be followed by questions with Angela Cooper, one of the extraordinary women featured in the 25 minute film. Kala Sangam, working with the Peace Museum, will present a performance of Ice&Fire Theatre Company’s production This Is Who I Am, on Thursday, 21 February. The show offers first-hand accounts of LGBT+ people seeking asylum in the UK, read by members of the Actors for Human Rights Network. There will also be a post-show discussion. Bradford Council will be supporting LGBT history month on social media, including on its Instagram account BradfordYouthVoice. Kersten England, Bradford Council’s Chief Executive, said: “Raising the flag for LGBT history month shows our support for events happening locally across the district, and demonstrates nationally how we are backing the aims of LGBT equality. Thank you to our partners across the district who are providing a packed programme of fun and educational events. Bradford Council’s youth service groups provide peer support for young people to meet, socialise and get involved in activities and events. Anyone interested in the Youth Service’s activities can find out more by searching for Bradford Youth Service on the Council’s website.